Superb hot-rodded ‘Plexi’ sounds that sound great for both live and recording environments. Not so much clean headroom available here - but with sounds this good, we don’t mind. Vox’s new MV50 heads are not much bigger than a stompbox and come in three different flavours: Clean, AC and Rock. The Rock variant is a hot-rod that is inspired by classic British amps of the 70s. It is also the model that we’re looking at today. While Class D power delivers a maximum of 50 watts into a four-ohm load, the real revolution is in the preamp. The MV50 use valves - not just any valve but a new design called the Nutube 6P1: a clever bit of lateral thinking by Vox owners, Korg that uses a tiny fraction of the energy of a 12AX7. The Rock has a black and chrome steel chassis; a diamond-shaped window on the top shows off the neat 6P1 valve, while the control panel’s main feature is a backlit VU meter. Removing four small machine screws releases the lid, exposing a miniature work of production engineering art, where practically every cubic centimetre of space is filled with something. Four smart red PCBs support a mix of surface mount and miniature discrete components, with the 6P1 (sat on its own board) piggybacked over the main PCB. Along with a single input jack, each amp has three mini chickenhead knobs, used for gain, tone and volume. The rear panel features a speaker-emulated headphone/recording output and an EQ switch that changes the output from a flat response, intended for large cabinets, to an enhanced bass lift that works with the MV50’s partner cabinet, the specially designed BC108. There’s a single speaker outlet with switchable four-, eight- and 16-ohm impedance settings, as well as a power switch together with an ‘Eco’ function that turns the MV50 off after about 15 minutes of idle time, and a socket for the laptop-style 19-volt DC power supply. The Rock is exceptionally quiet, with very low hiss levels and zero hum, thanks to the external DC power adaptor. You might think with only three controls on the front panel you’d be somewhat limited in terms of tonal range, but that’s not the case. This amp is perfectly dialled in. 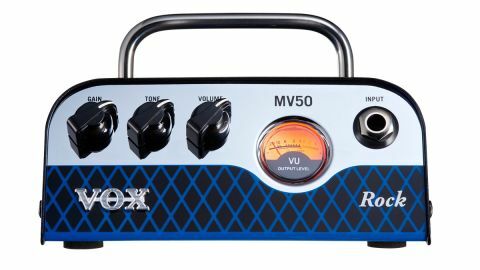 The MV50 Rock delivers stunning hot-rodded ‘Plexi’ tones, covering classic Hendrix and Kossoff at lower settings, while the upper reaches of the Gain knob will get you Billy Gibbons and Van Halen, with a few appropriate effects plugged in. With The Rock, there’s no channel switching, digital effects or loops, but what you do get is serious tone that holds its own in any environment with enough power for recording, rehearsal and small gigs, in a package no bigger and no more expensive than a high-quality stompbox. From beginner to pro, the 6P1-powered MV50 could very well turn out to be a game-changer. It’s a credible step into the future and proof that, after over half a century, the Vox spirit of innovation is still very much alive.